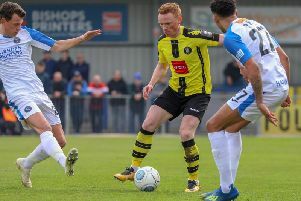 That was the message from club captain Josh Falkingham as Harrogate Town prepare for their long trip to Dover Athletic on Saturday. The Wetherby Road outfit were knocked out of the FA Trophy by Stockport County last time out, contributing to their own downfall by gifting their opponents possession prior to all four of their goals at the CNG Stadium. Yet skipper Falkingham believes that playing out from the back and being brave in possession in tight areas have contributed massively to Town’s success over the last 18 months, and insists that his team-mates must stick to their guns as they bid to break back into the National League play-off picture. “We can’t let the mistakes on Saturday affect us going forwards. The way that we play means they can happen, but we have to keep doing what we’ve done so well since I’ve been here,” he said. “Our style of football is a big part of the success we’ve had and, as players, we have to continue to believe in what we’re doing and keep wanting the ball in tight situations. “The gaffer doesn’t want us to over-play, it’s a case of knowing when to play and when not to, but we don’t want lads to stop showing for the ball or trying to play through the thirds. Town have not contested a National League fixture since they beat Hartlepool United 3-1 on January 19, and their inactivity has seen both Sutton United and Gateshead leapfrog them in the table in recent weeks. They now sit in eighth position, a point behind seventh-placed Gateshead, albeit having played two games less than the Tynesiders. This is the first time that the club have found themselves outside of the play-off spots since the opening weeks of the campaign, though Falkingham says his team-mates won’t let this faze them. “Obviously we’d rather still be in a play-off position than sat just outside, but to be honest, it’s not something the lads will be giving too much thought to,” he added. “We’ve got games in hand on Gateshead and if we win them we’ll go above them, however we’re not looking even looking that far ahead. “All we are focusing on at the moment is going to Dover and getting a result on Saturday.